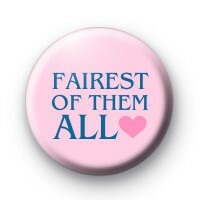 This light pink badge and has the slogan Fairest Of Them All written in blue font and a pink heart at the end. If you like the movie Snow White then you will recognise this quote. Its also just a really lovely thing to say to someone and quite romantic. It would be a lovely token of your love and could be a simple handmade gift. We have lots of fun romantic slogan badges in the shop so if you'd like a few more designs, be sure to check those out too. All our badges are handmade in the UK.